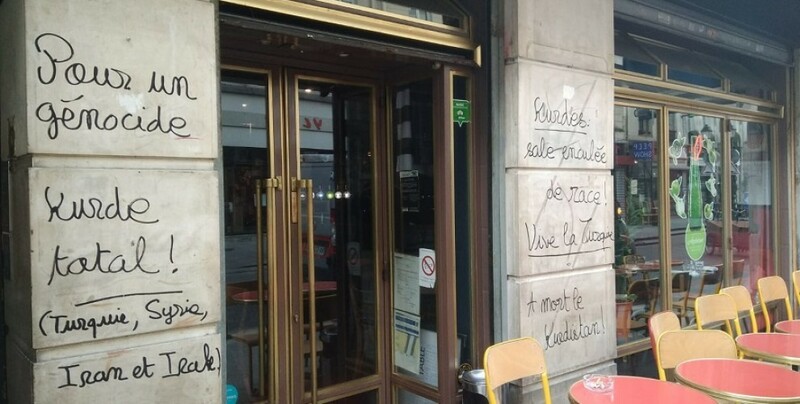 The Kurdish-owned restaurant Mala Bavo in Paris’ 10th neighborhood suffered a racist attack. Turkish fascists wrote racist graffiti insulting Kurdistan and calling for a Kurdish genocide on the walls of the Kurdish-owned restaurant. Mala Bavo’s owner Seydi Aslandag said the walls of the restaurant were filled with graffiti, one of which said “Total Genocide for Kurds in Syria, Iran, Iraq and Turkey”, after closing time and that they are certain it was Turkish fascists who attacked the building as there were also pro-Turkish and pro-Erdogan graffiti on the walls.